SiteW has updated the shipping methods of your online store. You can configure them precisely: you can choose any type of carrier, select Home, Pickup point or Shop delivery, you can adjust your prices according to the nature of your parcels, offer any kind of discounts, or you can make shipping free. SiteW offers you many features, so that you can find the shipping methods, that perfectly suit your needs. In this case, a flat fee is calculated according to the cart amount, the weight or the number of items. Prices are set according to geographical areas (list of countries). The amount is automatically calculated depending on the weight of the parcel and its destination. Many carriers are available (DHL, Fedex, UPS, …). The main providers are available: Mondial Relay, bpost, Chronopost,... You can enable this option, when selecting a carrier, or when creating a custom shipping mode. Pickup points are suggested according to the destination address, with map preview and display of opening hours, if this information is available. NB: You have the possibility to add any other shipping service or carrier, either with the method “Other carrier” (included), or, optionally, by integrating the solution of a shipping provider or by adding pickup points (a chain of stores, for example). How to create discounts or make shipping free? Discounts on shipping costs apply according to the cart amount. They can be in the form of a fixed amount or a percentage. You have the possibility to create discounts only for some destinations or shipping methods. You can also make shipping completely free. Your shipping information can be displayed in the product description, the cart summary and the cart. Show the estimated delivery time for the cheapest and fastest shipping method. The delivery deadline is determined in accordance with the time you need to prepare the order, and with the time needed by the carrier to deliver the goods (this information is given by the carriers themselves, or you can determine it according to the destination). Show a sentence indicating the total amount necessary to obtain free shipping or a discount. This sentence can be displayed instead of the shipping amount in the product description, as well as in the cart summary, to encourage your visitors to buy more, in order to enjoy free shipping or discounts. Detects the country (destination can be changed by your customer in the Cart step, in the “Personal information” step). 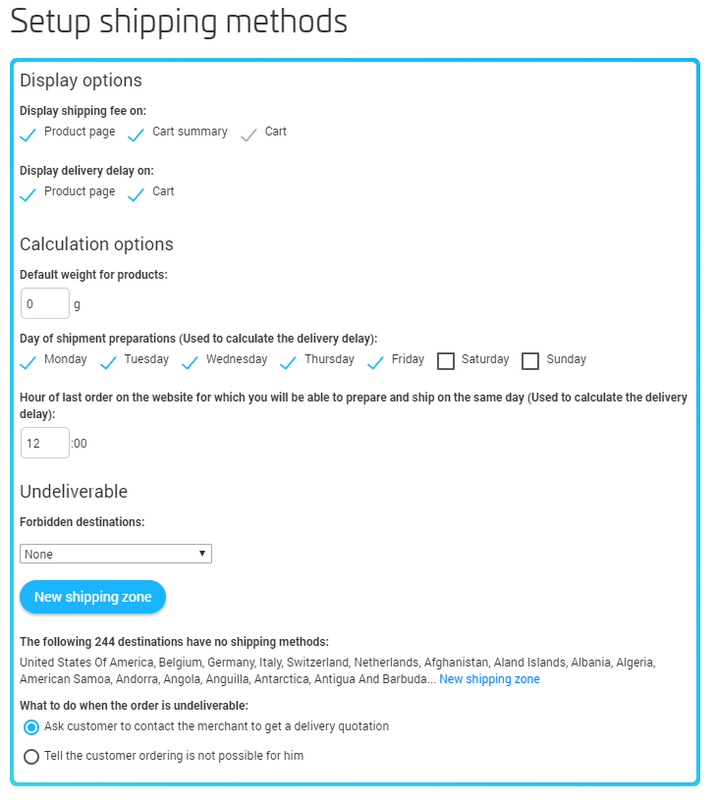 Only displays the available shipping methods (for example, if you offer different shipping methods depending on the country, only the appropriate shipping method for your customer’s country will be displayed). Displays a message in case of an undeliverable order (for example, if size or weight exceeds the capacity of the carrier, if the destination is forbidden, or not accepted by the carrier): the customer can then either change the country, or contact you (if you enabled this option). Restrict shipping methods to certain product categories. For example, a carrier can be reserved for bulky items. Automatic combination of costs: when one of the order items has specific characteristics, for example if an order contains a standard product and a bulky item, the shipping costs will combine the standard cost and the specific cost for large items. 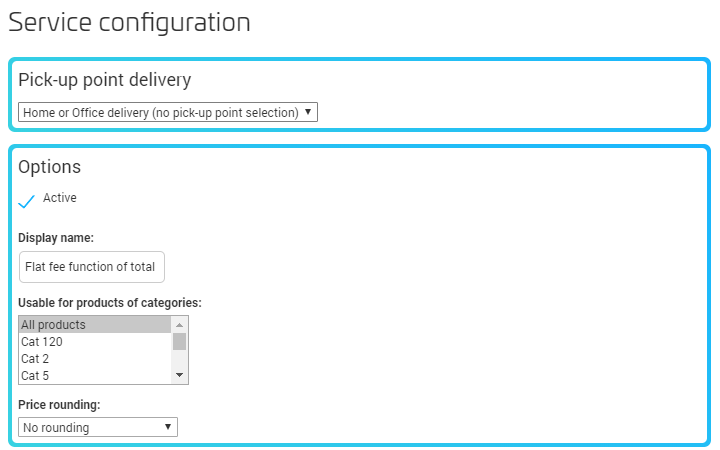 How to configure your shipping methods on SiteW ? These services require to specify the dimensions of the parcel. So you can keep the predefined standard size, or modify it, if your items are large. Shipping prices can be calculated per item (shipping costs per item), or for the whole cart (combination of shipping costs). The price is automatically calculated and corresponds to the price charged by SiteW for a label order. Some shipping services have different prices depending on destination (for example: Chronopost, Chronopost Europe, Chronopost International), remember to add all the destinations, if you want to be able to deliver worldwide. These services are preconfigured with 2018 prices. Once the option is enabled, you can modify the predefined levels. Bpost and pickup point delivery services are also available. It is possible, optionally, to add your bpost contract and automatically order labels. This method is preconfigured for free shipping with store pickup. This solution is displayed on the product page, in addition to home or pick-up delivery, and it is not displayed if you offer free shipping. That way, your customer is fully informed of the most beneficial solutions. You can define whether it is a home or store delivery, or you can enable pickup shipping: in this case, the visitor will have to select a service in the list (Mondial relay, Relai colis, Chronopost, bpost, ...). This will allow you to set your own prices for this delivery option. Set your prices in the “Shipping costs” area. Choose the delivery zone (list of countries): you can choose an already existing area, or create a new one. Define levels in grams and set the price, as well as the delivery time. Make sure levels are coherent, because if not, some orders may not be deliverable. Enter actual costs, even though you offer free shipping (free shipping must be enabled somewhere else). NB: Shipping costs can be unrelated to weight: they can be related to the number of items or to the total amount of the order. This can be useful to offer competitive prices, or simpler rules (for example, unique shipping costs for the whole website). Once again, make sure your levels are coherent, otherwise some orders may not be deliverable. You can choose your display areas (product page, cart summary or cart) for shipping costs, discounts and delivery time. To estimate preparation and delivery time, you have to specify what days you can prepare orders, and the time before you can give the package to the carrier, in order to be able to ship the same day (if you ship the next day, enter 0:00). Define forbidden destinations, if needed. For example, if you have created a worldwide delivery method, but don’t want to ship to a specific country, add it there. Choose whether you want a sentence about the discounts available to be displayed: this sentence will be displayed in the same location as shipping information, either in addition or instead of it, which allows to encourage your customers to buy more, in order to enjoy the discount. You can create several discounts. The discount that applies with the next higher cart amount will be displayed. Every discount applies to the chosen delivery areas and shipping methods. That way you can offer a discount that only applies to certain countries or certain shipping methods. If you don’t want any restriction, select “Worldwide” and “Any shipping method”. You can make shipping free, or create a percentage or cash discount. If the discount amount exceeds the shipping costs, shipping will be free. Discounts apply to normal shipping prices. Free shipping for all orders of more than $29 delivered in a pick-up point. $10 discount on shipping costs for orders of more than $70: it is not necessary to set restrictions for the country or shipping method. Depending on destination and delivery method, shipping will be free (for the cheapest shipping options), or will be cheaper (for the most expensive shipping methods). This guide lists all the available options and features, to precisely configure your shipping and delivery options. Feel free to use the information display and create discounts, to improve the marketing strategy of your online store.